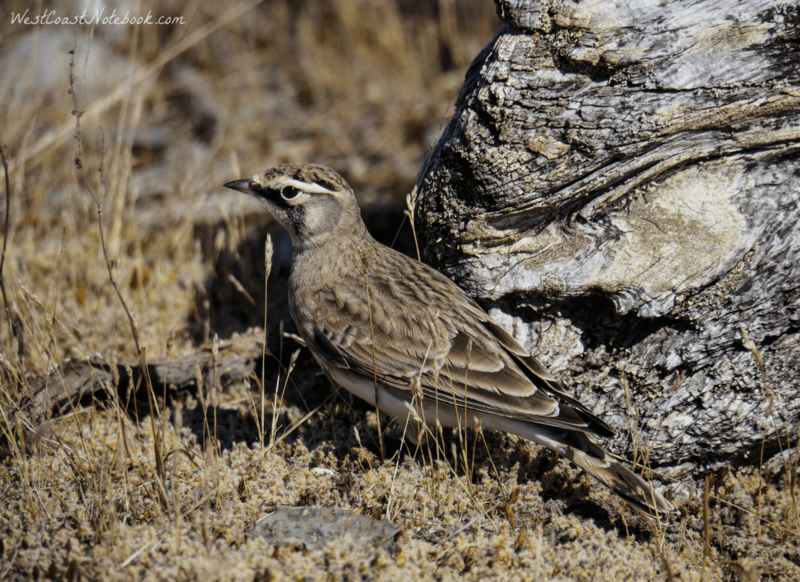 Well… actually the Horned Lark did have horns, he just wasn’t sharing them on that day. Instead, he was just quietly going about his or her business. 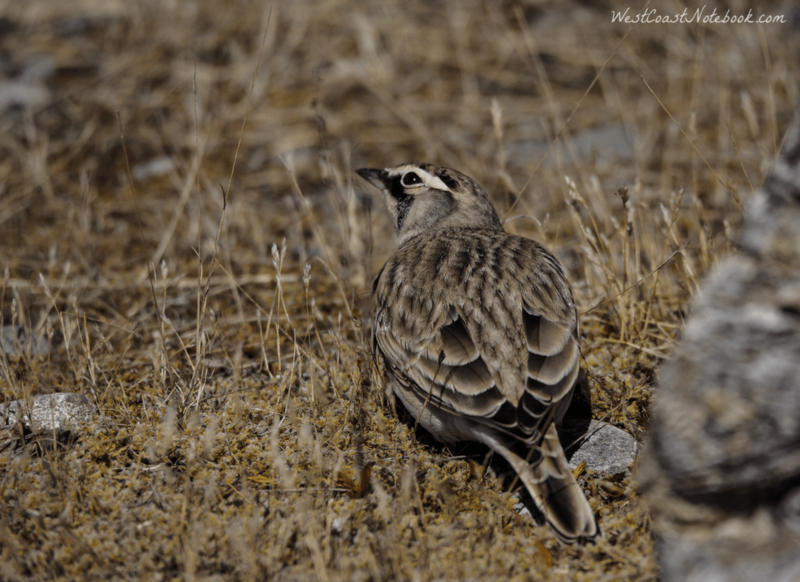 It all started with the Lark Sparrow. I met Cathy at Whiffin Spit to see if it could be found again. As mentioned in my last post, we scoured the spit looking for it and it ended up being right in the parking lot. As there were a few other birders looking for the same bird, it was nice to get caught up with people that you wouldn’t normally see in this area. 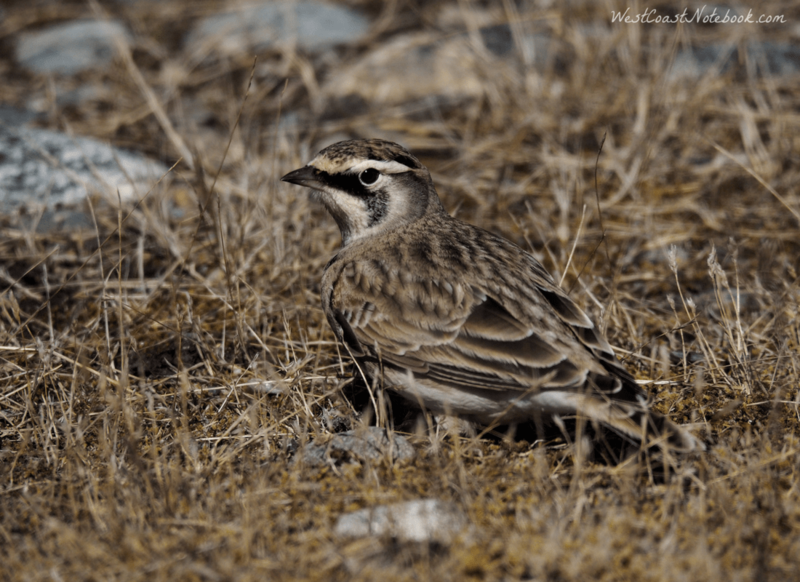 After walking down to the end of the spit and deciding that the lark sparrow might have done a bunk, both Cathy and I had the inclination to walk through the first field again. As we took a few steps off the path we almost stepped on a bird that was foraging on the ground. It seemed very unconcerned with us as we grabbed our cameras and started to roll. You just never know if they will fly or if you will get a shot beyond the first one. But… this being a most cooperative bird, it just continued minding its own business and ignoring us. 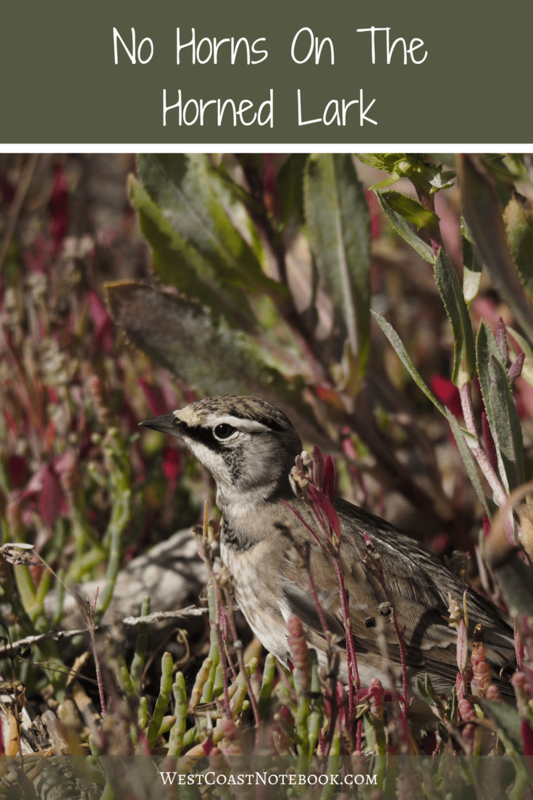 We knew that it wasn’t a local bird to this area so we mental ran through our bird books and came up with Horned Lark. The last one that I’d see was four years ago. They come through on their fall migration and this one chose to have a rest and feed here this year. Soon we had a crowd of people around it including a man from Texas who just missed getting his house flooded as Hurricane Harvey came through. And still, the bird just ignored us. At one point in time, I was sitting on a log and it came so near to me that even with my cameras telephoto lens backed off I couldn’t get it in focus. It was that close. As I mentioned, here we are standing, sitting and talking around it and the bird just kept eating and slowly moving around and occasionally looking to the sky for predators. A little while later its head come up and its body hunkers down and someone says… “Look, there’s a Merlin“. The bird was in some grasses, well camouflaged and after the initial sighting it sat up and watched the Merlin until it flew off. Then it continued feeding. Which just goes to show how inconsequential we really were to the bird. He never saw us as a threat. But when he saw a threat he knew how to cover. 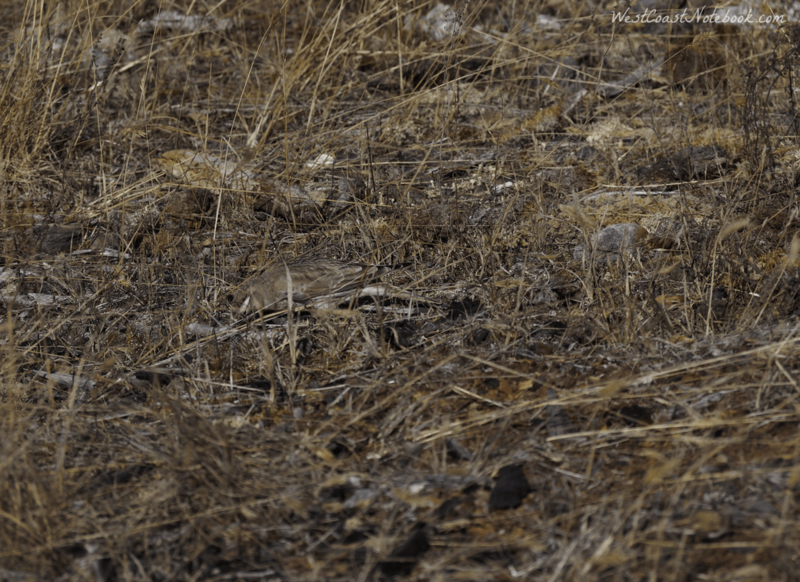 The horned lark was feeding in the brown grass and if you took your eyes off of him, it was hard to find it again. It was amazing we found him in the first place. If he had just been off to the side a bit, we never would have seen him. Finally, a helicopter flew in quite low and startled the bird. He gave some alarm calls and flew off. Must have thought it was the biggest bird of prey he’d seen and he wasn’t taking any chances. I went back the next day hoping to see it again, but no such luck. He could have been right next to me in the grass and I wouldn’t have known he was there. Makes me wonder. How many birds have I walked by without even knowing they were there? Too many to count I’m sure. 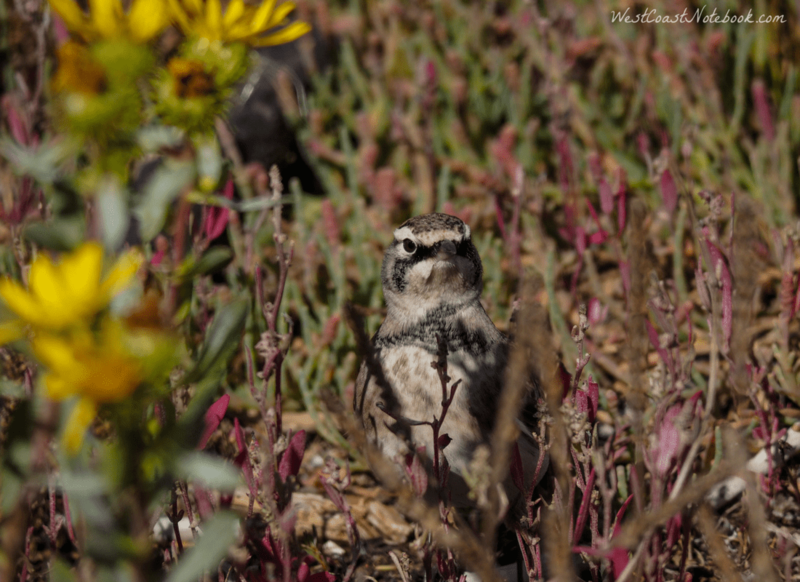 Here is a short video of the Horned Lark feeding. Enjoy!